One of the joys of touring an old, premodern pile isn't just looking around at the stately furniture and beautiful wall coverings, but looking up at the fine materials, intricate murals and meticulous detailing that crown each space. Buckingham Palace, say, would look completely bald if not for the gilded, soaring finery that sings overhead in every area. This is true not only for the kind of regal, ceremonial manses you need to buy a tour pass to enter, but for much more modest abodes as well. Mass-produced pressed tin, for example, was an affordable option to cap a kitchen with pretty, repeating patterns a century ago. Now, any remnants of the stuff are a joy to come across, even in the simplest home. These days, many of us live with popcorn ceilings, a euphemism if there ever was one. What it actually looks like, in truer if harsher terms, is semi-digested cottage cheese, spewed up – way up – all over the top of a room. It was invented as a lazy way to hide any cracks in the drywall, and looks exactly that – lazy. Flat white plaster is better, but mainly in the way that a simple crew cut is better than a mullet. When, as a society, did we let our ceilings get so ugly? To be sure, a living room doesn't need the ceiling of the Sistine Chapel to look smart. It can be simple, understated and contemporary while avoiding the common default options of truly ugly or merely inoffensive. And turning an eye to this currently ignored canvas can have many wonderful impacts on the quality of a space. It can create tantalizing textures, or make a room feel warmer, cozier or more dramatic. Yes, these days, beautiful ceilings might be a lost art. But there is hope. Here, five standout examples that show a better way forward. The white oak ceiling and walls help frame the canopy of nearby trees. For the master suite of a midtown Toronto house, architect Meg Graham, co-founder of architecture studio superkül, wanted to create a cottage-like escape – somewhere to get away from the hustle and bustle of city life. The wall-to-wall windows help, making the space feel like it's in the country by framing a canopy of nearby trees. But to truly heighten the effect, she wrapped the room, including the ceiling, in warm white oak, creating an enveloping place to hibernate that would have been ruined with a standard white lid. "How better to marry a room in the trees with the trees themselves?" Graham observes. "The oak ceiling truly enhances the connection between the architecture and its environment." Angular white walls add drama to this Toronto home. Simple, white drywall ceilings aren't all dull. When pinched, folded or meeting at interesting angles, they can add surprising drama to a room. It's like the difference between a flat sheet of paper and a clever work of origami. 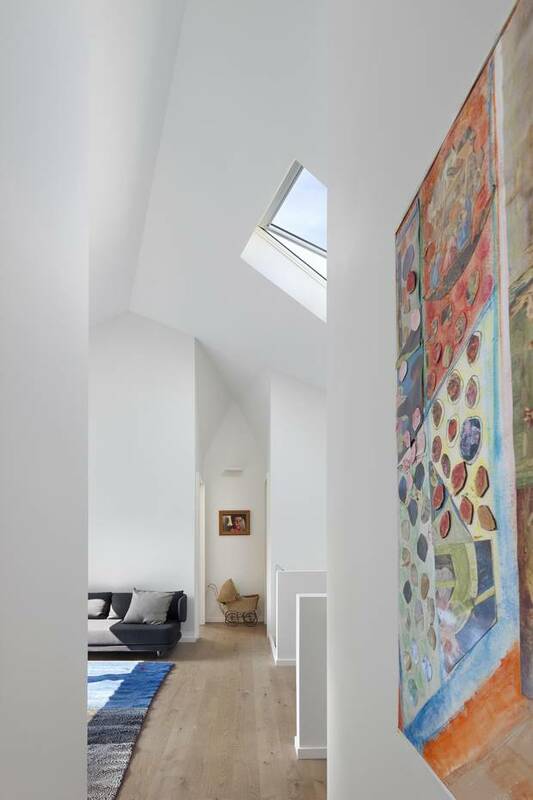 For a Toronto home, Merike Bauer, co-founder of architecture studio Reigo & Bauer, "changed the pitch and orientation of the ceiling planes," she says. The folds are instrumental in "animating the space through the effects of light and shadow." Repeating slats of wood draw the eye to nearby Vancouver Island in this B.C. home. Most homes don't come with maps or manuals that explain how best to enjoy the place. Sometimes, though, the architecture – and specifically the ceiling – can help orient a visitor, and guide their experience. 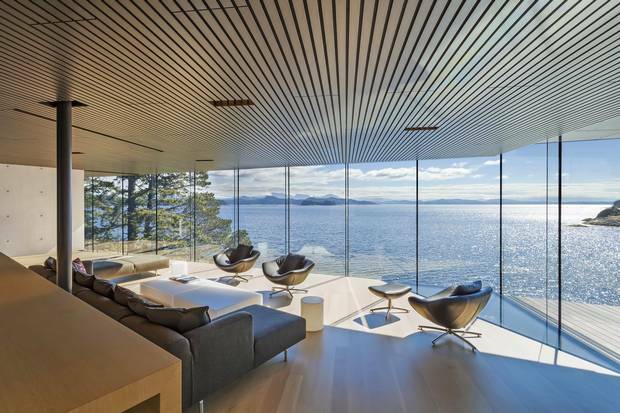 At the British Columbia home of philanthropists Eric Peterson and Christina Munck, Vancouver architecture firm Patkau used the ceiling to point the way, literally. In the living room, clean-lined, repeating slats of wood draw the eye to nearby Vancouver Island. The dark tone of the surface contrasts and emphasizes the bright, sunny outdoors. Using a variety of textures creates an ‘atmospheric experience,’ Batay-Csorba partner Jodi Batay-Csorba says. One of the nice things about old Victorian houses is the amount of texture, both inside and out. Rough bricks, plaster mouldings, silk wallpapers all came together to create a tantalizing patchwork. While keeping a contemporary aesthetic in mind, Toronto architecture studio Batay-Csorba wanted to introduce a similar variation of surfaces into an otherwise clean-lined abode. The ceiling exemplifies the approach. 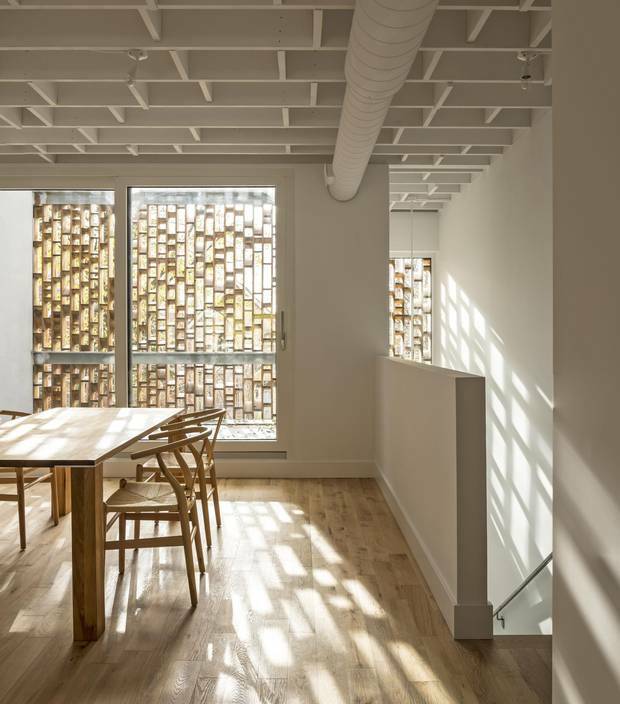 "We created texture by exposing the joists and increasing the number of blocking members between them," says one of the studio's partners, Jodi Batay-Csorba. "Together, with the brise soleil on the front façade, it creates a fully immersive, atmospheric experience." Architecture firm Shim-Sutcliffe paired a row of clerestory windows with a gently sloping roof line in this Haliburton cottage. Although ceilings tend to be opaque, they can help illuminate a space. For a cottage in Ontario's Haliburton region, architecture firm Shim-Sutcliffe paired a row of clerestory windows next to a gently sloping roof line. "We believe ceilings make an important contribution to the experience of a home," the studio's co-founder Brigitte Shim says. "Here, wonderful south light from the large clerestory windows washes across the wooden trusses and the wooden ceiling plane, bringing warmth to the main family gathering space."